Why learn to swim? While drowning death rates have decreased over time for most age groups, children under age 5 still have the highest risk of drowning. Let’s get the medical opinion of Dr. Weiss MD, FAAP and lead author of the policy statement regarding drowning prevention. 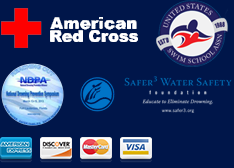 “Drowning is a leading cause of injury-related death in children. To protect their children, parents need to think about layers of protection,” said Jeffrey Weiss.